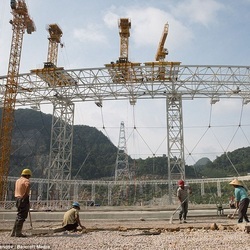 China is building the world’s largest radio telescope in Guizhou province, Xinhua news agency reports. Construction for the Aperture Spherical Telescope started in March 2011. The project is now expect to be completed by September 2016. Around 9,110 people from the Pingtang County, Guizhou Province, have been asked to relocate by the authorities in order to provide a better environment for the radio waves, the People's Daily Online reports recently. 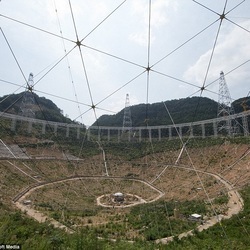 The gigantic radio telescope, cost approximately 1.2 billion Yuan (£120 million), will allow scientists to get weaker radio signals from outer space, even further than our solar system, reported People's Daily Online. It has been described as 'ears' and will help scientists listen to the universe. ​Scientists from different fields, including physicists, geologists and astronomers, welcomed the construction of the new telescope as it will boost the human capacity to observe outer space. Chen Xuelei, a physicists said that the data can help prove Einstein’s relativity theory once more data of gravitational waves can be retrieved from the telescope. ​​​The telescope is made up of 4,450 reflective panels. The size of the dish will be about thirty football pitches. Cables are attached to every reflective panels to control its coordinates. 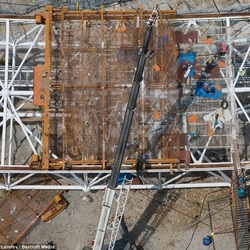 Li Di said : ‘The biggest challenge of this project is to calculate quickly and attached these data to thousands of computers to change the direction of such a gigantic telescope. ​​​The Arecibo Observatory in Puerto Rico will lose its title as the largest single aperture radio telescope ever constructed. The Chinese FAST will be able to survey the outer space ten times better than Arecibo. ‘We are aiming to discovering something that is worthy of a Nobel Prize. Although we built the telescope, we welcome scientists from all around the world to use it,’ Li Di added. 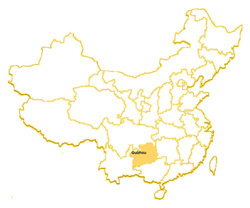 FAST is built in the Dawodang depression in Guizhou Province. The natural landscape provides the perfect size and shape for the construction of the telescope. The ground also provides enough support for the gigantic telescope.